This Is A Very Strong Correlation. But Is It Spurious? Does higher consumer confidence mean more hotel stays? 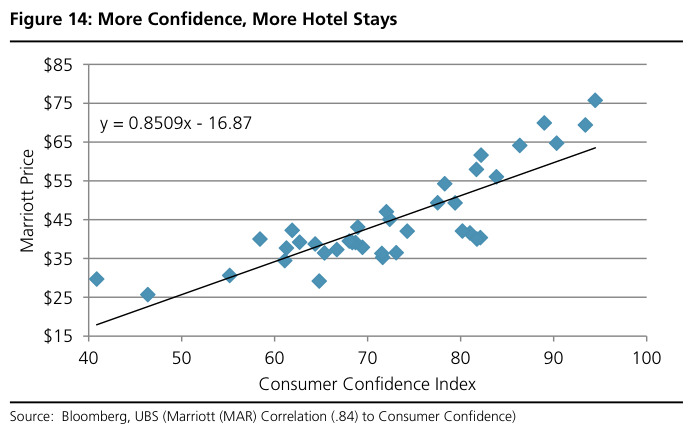 We’re a little sceptical, but UBS’s Julian Emanuel does fairly sufficiently prove at least correlation here (granted, this is stock price, not hotel stay price). But is it spurious? Hedge fund manager David Einhorn recently warned Business Insider to be wary of peculiar correlations. The context here, per the UBS note, is that currently energy prices are low (which means more money in Americans’ pockets) and consumer confidence is high. This means things could be looking up for companies in the hospitality business, like Marriott. What do you think? Let us know in the comments or tweet @themoneygame.